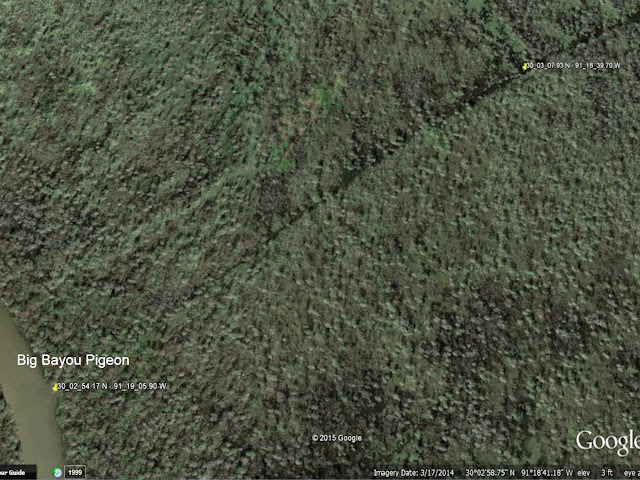 The Bayou Pigeon / Grand Lake vector of Atchafalaya River Basin has many hidden, little-known places and trails. 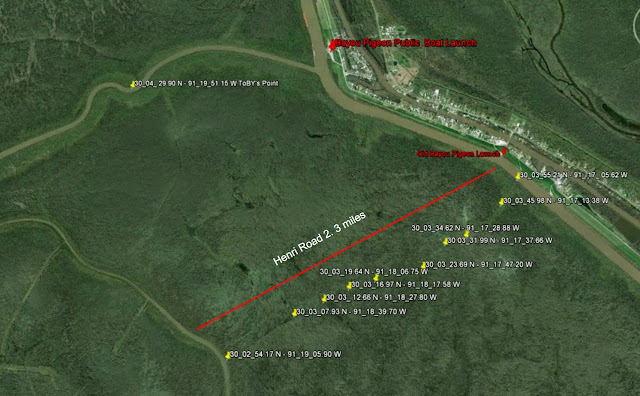 One such trail in the Bayou Pigeon area is called Henri Road, or “The Road” for short. Once you know the “the Road” you discover that's its a pretty decent path not just a blaze / painted line through the swamp. However it looks different at different water levels and you can get turned around easily. It is not navigable year around. 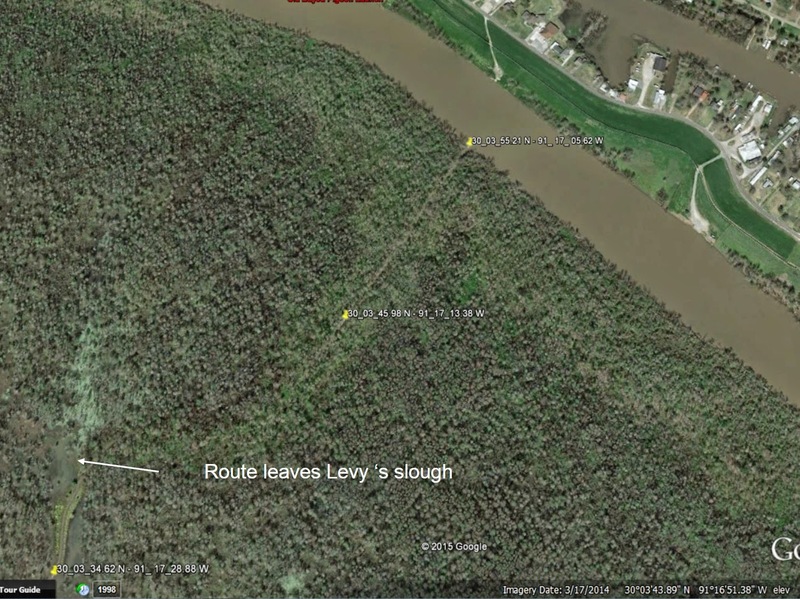 The primary reason the Swamper's maintain 'Henri Road' ie., cleaned out and marked each year is to enable a shortcut for them to travel to the Big Bayou Mallet / Little Bayou Mallet / Lost Bayou area, versus traveling the long meandering Big Bayou Pigeon. ‘The Road’ will save 20 minutes by boat to the Bayou Mallet area. In the old days of slower boats it was as much 45 minutes. On page 662 of the book, we give a brief description Henri Road. The purpose of this posting is to provide a better understanding of the importance Henri Road in the history of the Bayou Pigeon commercial fishermen. 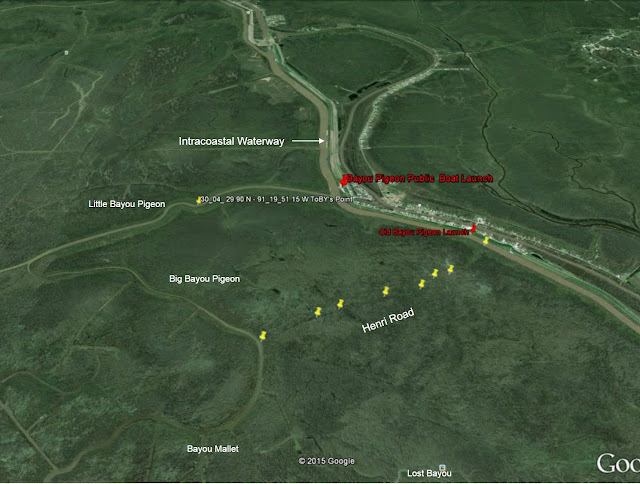 We will start explaining the trail / path / route from the Big Bayou Pigeon end of the trail. 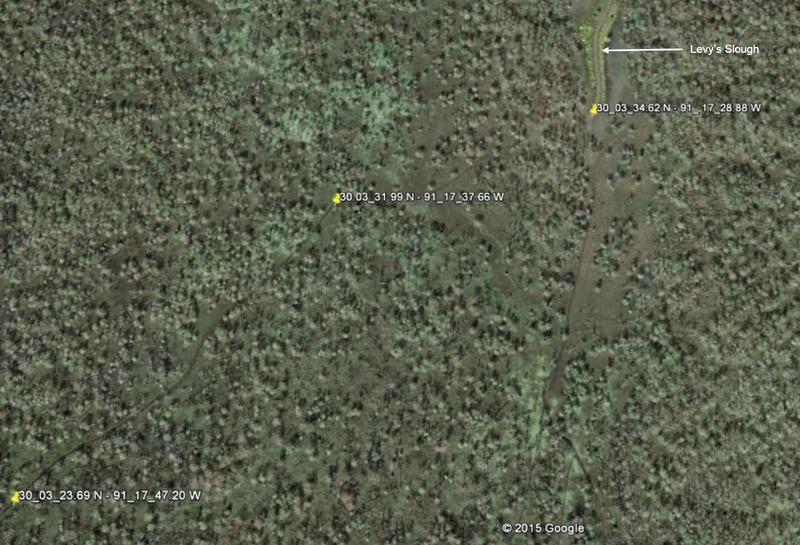 The Road starts as an old log skidder run on Big Bayou Pigeon then appears as a man made cut trail, intermittent natural sloughs and / or long ‘Mares’. The route was marked by tree blazes in the 1950’s. In modern times, ie., 1970’s on by paint and / or ribbon flagging are used. The route cuts several miles off the route from the Bayou Pigeon Boat Launch to Bayou Mallet fishing waters for Commercial fishermen. Henri road has been marked maintained for sure since the early 1950’s. Most of the land, ‘The Road” transverses is privately owned property owned by Williams Inc. a land management company that started as the F.B. Williams Cypress Company, in the late 1800's. The Williams Inc. home office is in New Orleans, LA. 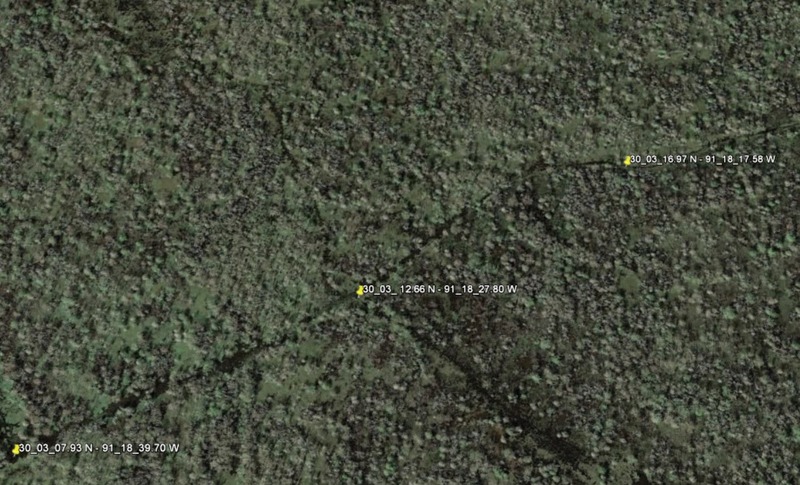 The above Google earth satellite image provides big picture perspective of the location of Henri Road and why it is so unique, ie., it is an isolated path across the center of the swamp. At night it seems like a haunted place. Henri Road is approximately 2.3 miles long. The path in places is only one boat width wide. 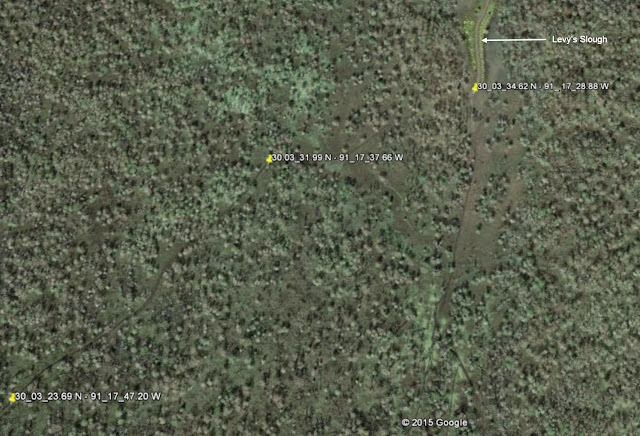 The GPS coordinates document the exact route. Until the technology of satellite photography and GPS technology became available the exact route could not be designated. 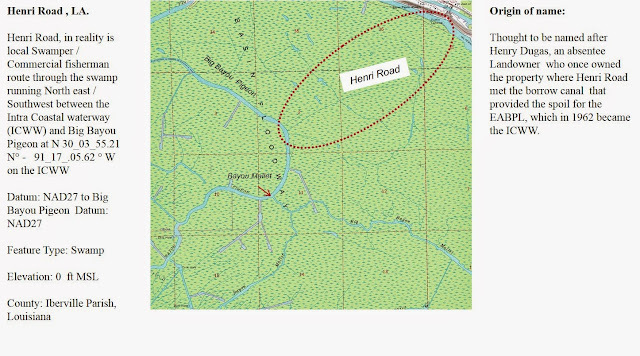 The amazing thing about the route of Henri road is that the old commercial fishermen actually marked the shortest route based on their knowledge of the swamps with no technology other than a compass, maybe. This first section of Henri Road, was part of a an old Log Skidder Run. Straight as an arrow, it is clearly evidence of a non random man made path. 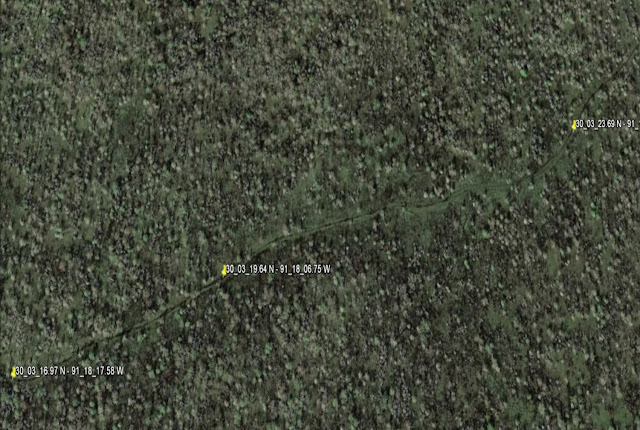 This second section of Henri Road, crosses a major ‘Mare” and continues on a Northeast vector and the path is very clear in the satellite picture. This third section of Henri Road, is still very clear from the satellite picture and continues moving at a distinct 45 degree N.W. vector. This fourth section of Henri Road, is where it connects to Levy’s slough, named after Mr. Levy Settoon. This fifth section of Henri Road, is where it leaves Levy’s slough, and goes to the ICWW. Caution, Enter at your own risk, it can be a long walk out !